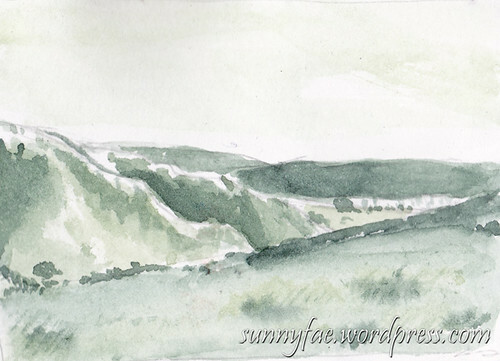 Last week we ventured out on to the horseshoe pass. It’s a pass between two sets of mountains near Llangollen in Wales. My parents used to take us up there when we were kids to pick whinberries (bilberries) but I haven’t been there for years. There are no berries at the moment; it’s the wrong time of year. You can walk for miles and see nothing but roaming hills, mounds of slate and sheep that wander over the heather. It’s a great place to get away from it all. 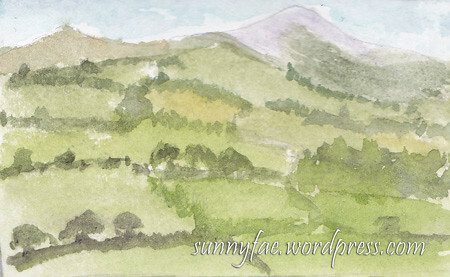 We challenged ourselves to draw a landscape in 15 minutes, this is the best I could muster, it’s only about 2”x3” I thought I would have a better chance of finishing something small. These are some of the hills in the distance. Once home I tried to paint from one of my photos, this was painted in one colour, perylene green trying to work out the tones. Did I mention the sheep? 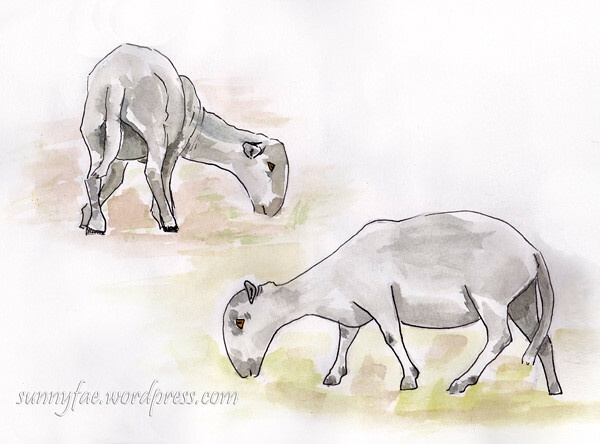 They had all been shorn recently so it was interesting to see their actual shape, they’re such a different shape with wool, see above for sheep sketches. 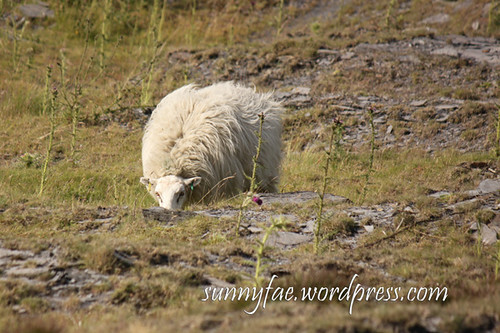 Have to say most of my photos were of the backside of a sheep as they walked away from us. This is the one that got away; she escaped the shearer’s clippers hehehe. I hope she doesn’t’ get too hot in this weather! 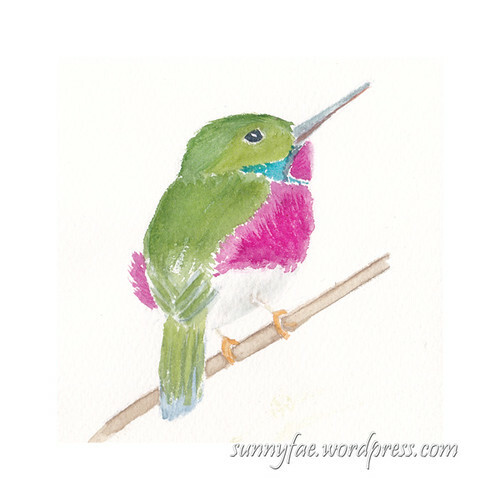 It’s world watercolour month as from the 1st July, this is where we all paint lots of lovely watercolours and share our stuff. 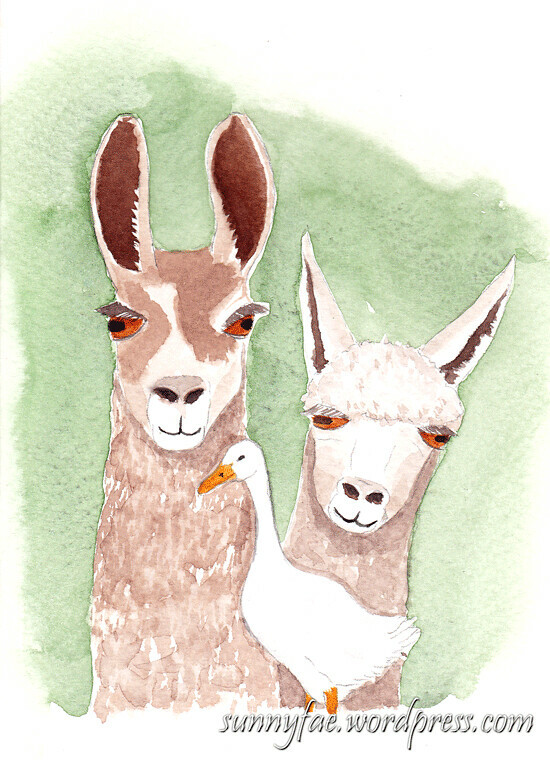 If you’re not sure what it’s all about hears the link to doodlewashe’s site to tell you all about it and if you feel like donating, it’s for a good cause. I’ll post my first seven up together next week to spare your in boxes or you can catch me on instagram if you want to see as they go up. 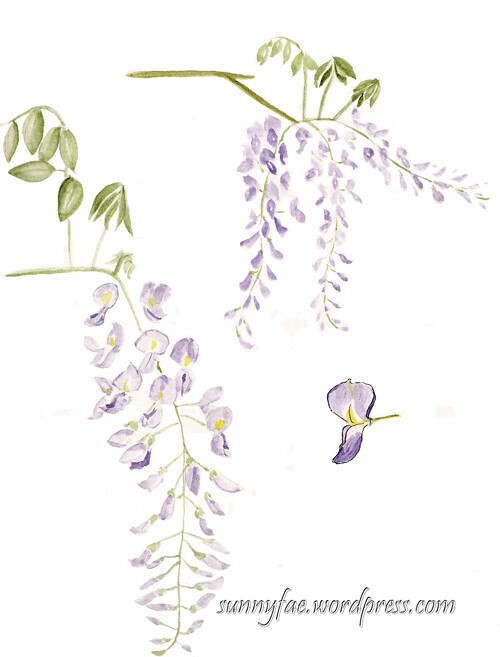 It’s the time of the year for wisteria. I love to see it flower. It hangs and drips off walls and fences, it really is beautiful. 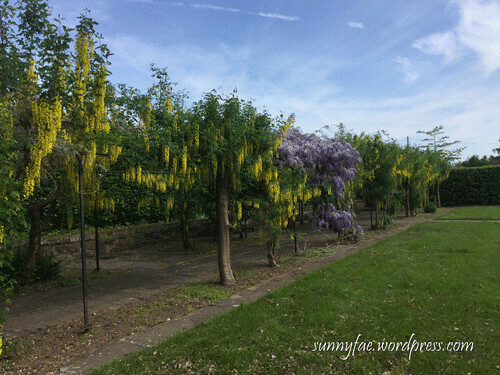 At the local botanical garden they have a lovely long arch-way covered in both purple and yellow wisteria. 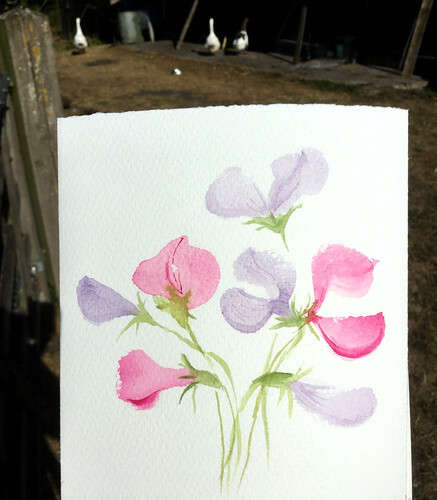 This part of the garden is currently free to the public so we decided to spend a day in the sunshine drawing it. 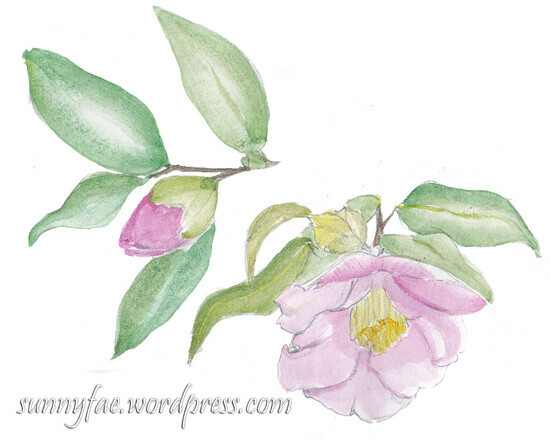 I find trying to paint the whole thing a bit much so I drew parts of the plant, much easier to deal with. 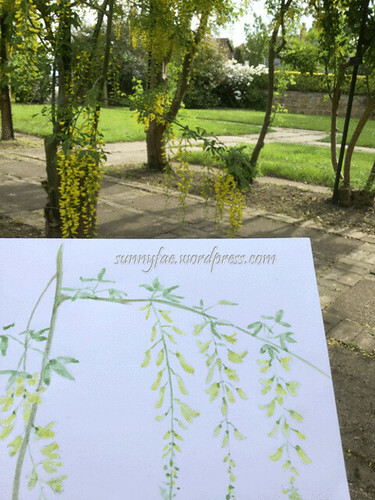 Here I am drawing the yellow flowers, again just a small branch with a few sprays of flowers on. 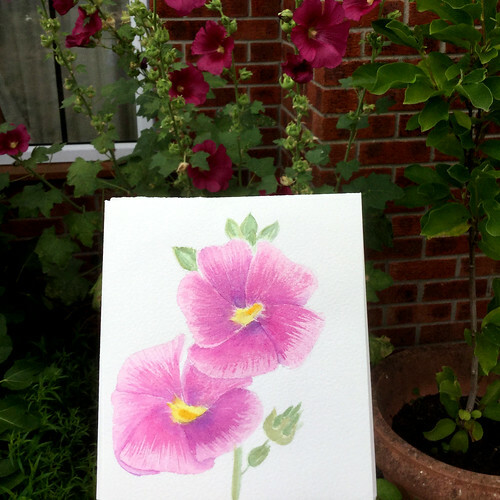 In this next one I was trying to give more of an impression of one of the plants, I was using my sketch book made from cartridge paper, not good for washy things so not a brilliant effort but it gives kind of the impression of what I was looking at. 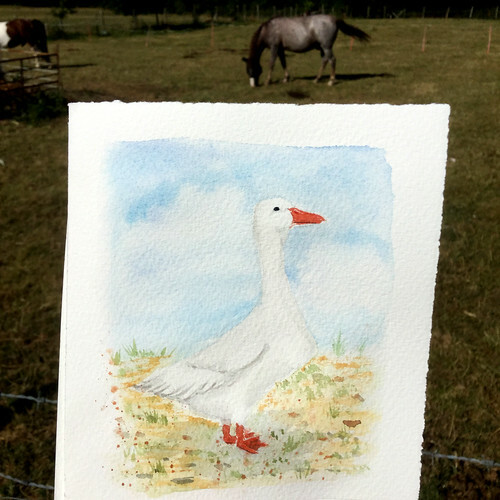 My daughter had brought watercolour paper with her and after seeing my poor effort gave a small piece to me. I’ll have to imagine the metal support of the arch structure because I had forgotten to draw it in. It’s funny how time flies and after being deeply engrossed in what we were doing realised it was almost time to go home. 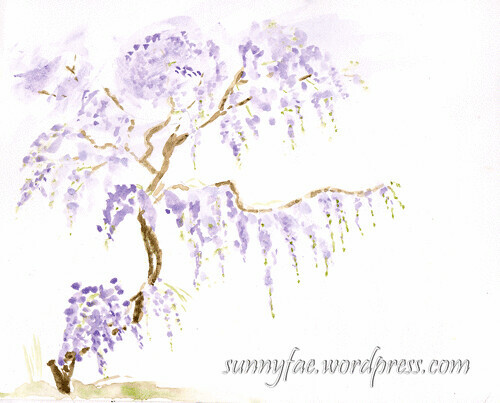 We set ourselves a challenge, 10 minutes to draw/paint some wisteria. Eeep! 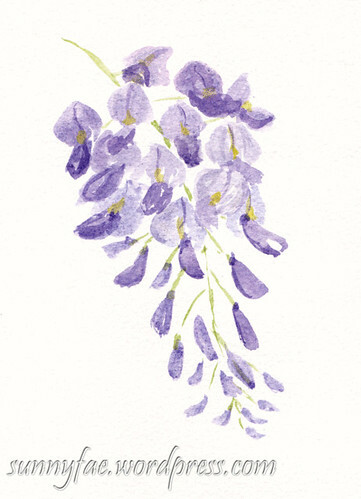 Where to start, I chose a bunch of purple flowers and started to paint, no drawing or roughing it out just straight onto the paper and since I now had a piece of watercolour paper that was what I used to paint them on. 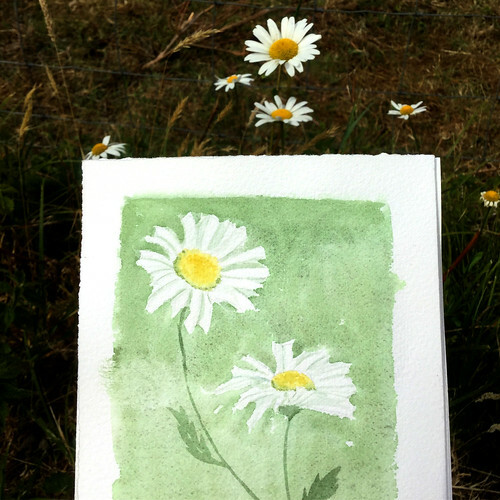 This was the painting from my 10 minute challenge. It was just a quick little sketch but this was actually my favourite painting of the day, it’s clean, simple and not overworked. Maybe we should do more of this it was a lot of fun. These sketches were drawn in pencil then tidied up at home. 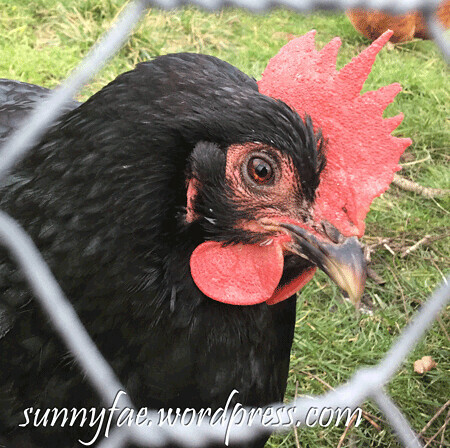 This week we went to a local farm park. I suppose it’s a kind of petting zoo for kids but there wasn’t any actual picking up of the animals (probably a good thing). Although they do sell food to feed the animals. We arrived just in time to feed the lambs. One of the farmers came out with a large crate filled with bottles of milk and we were all allowed to hold the bottles out to the lambs to drink whilst he told us a little about them. Dotted around the park were various coops containing different breeds of chickens, turkeys, pheasants etc. 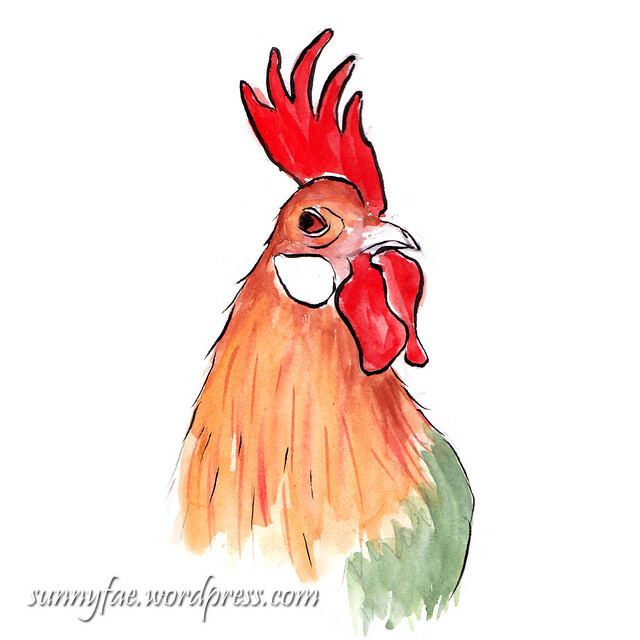 I have to admit I do love a chicken, we started to draw some of the birds, then wouldn’t you know it the heavens opened and the rain started. 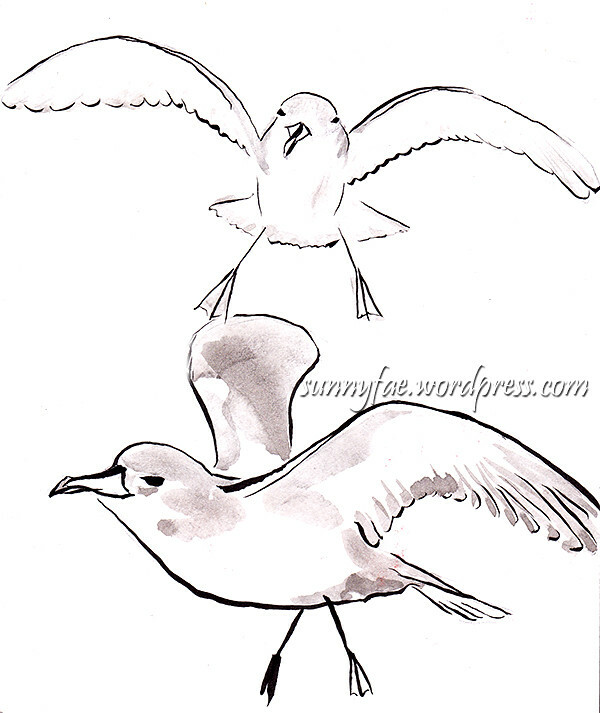 We’re not afraid of a bit of water but it’s hard to draw on wet paper so off for a cup of tea and home we went. Most of the sketches had been drawn with pencil and looked a bit scrappy so later on I got my brush pen and paints out and tidied them up a bit using some very ropey photos I’d taken on my ipod for reference. 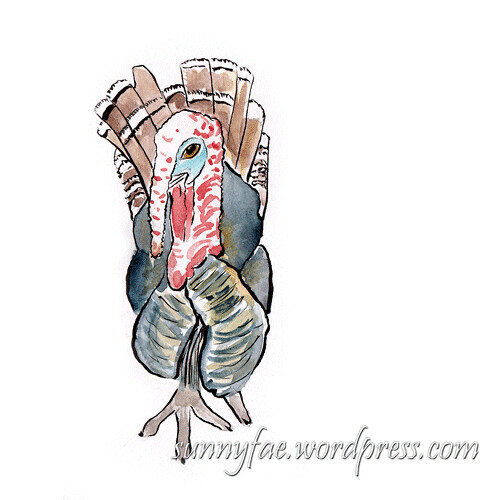 Some of the turkey photos were a lot better so I decided to draw from them. The shape looks a little off but I think that’s because of the angle at which I took the photo. 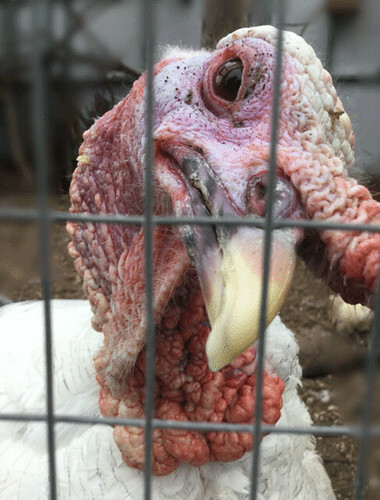 The front view of a turkey. Side view of a turkey. 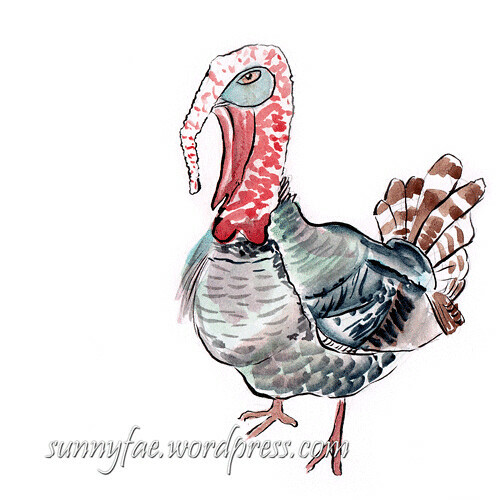 Turkeys are strange looking creatures, not what you would call conventionally beautiful, except maybe to each other. 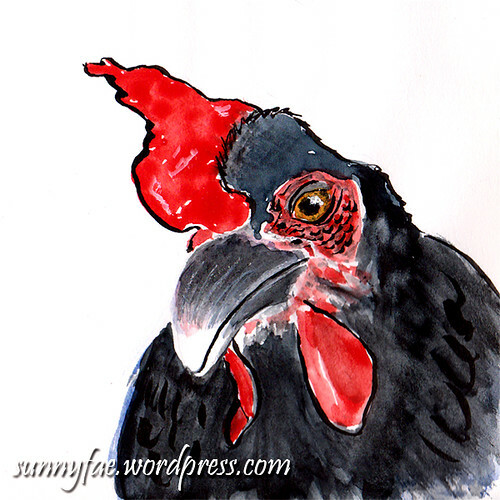 One of the turkeys gave me a very long hard stare and as he did his dangly bit (technical term hehehe) got shorter and shorter till he had pulled it right up over his beak! I didn’t even know they could do that. This turkey was giving me a very long hard stare! It was an interesting day out and since it wasn’t too expensive to enter we’ll probably go again, maybe draw some of the other animals. Thanks for taking the time to stop by today. Till next time, have fun. We’ve been away to London for a few days this week so we shopped, ate out and had a day out at Tate Modern as you do. This time we saw Picasso (works from 1932) and Modigliani. I’m not a great lover of Picasso but it was interesting to see the art in person. I liked the Modigliani a little better. It’s nice to see these artworks in person, to see the brush strokes and colours used by the artist even if it doesn’t resonate with me; I always like to have an open mind until I’ve seen them properly. For one of the days we didn’t really have anything planned so we went into the natural history museum to draw from some of the displays. We started at the bird cases; they have loads of stuffed birds from all over the world, even a dodo! 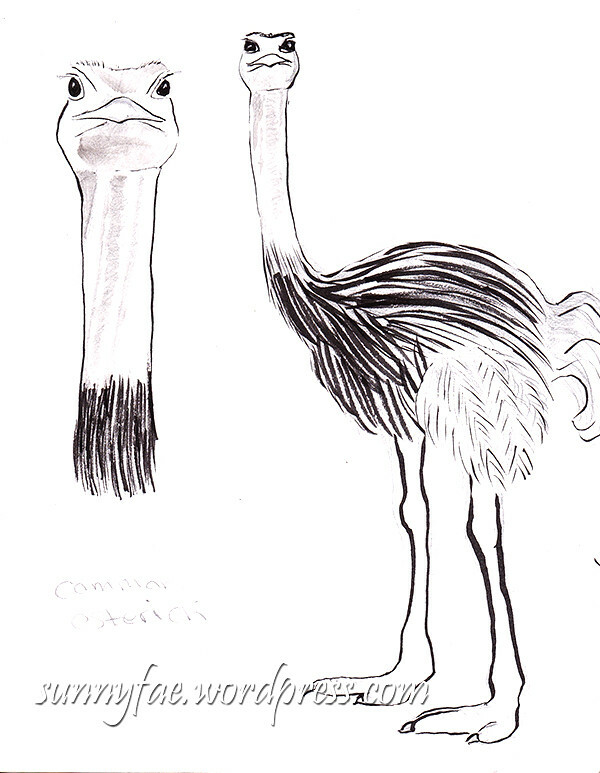 We weren’t able to get close to the dodo because there were so many people around it so settled for an ostrich, it was the first drawing of the day so it’s all over the place but it was fun to do. 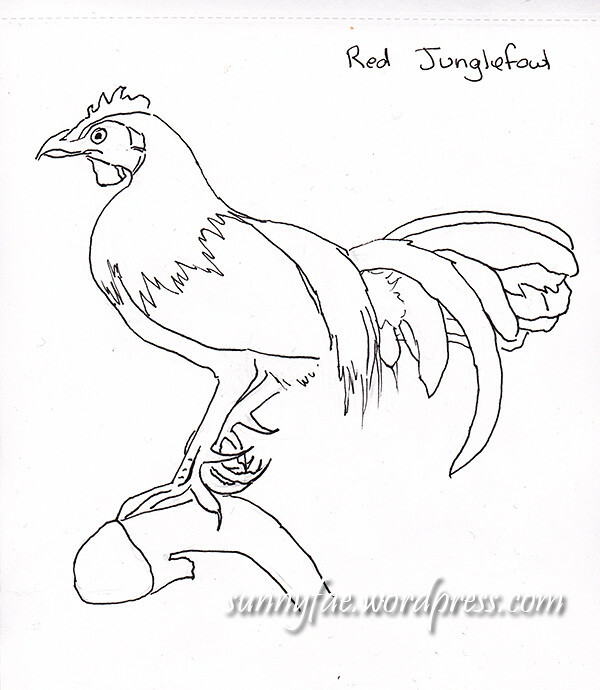 Next was a rooster (red jungle fowl) it was drawn in pencil but decided to draw over it with a fountain pen and clean it up a bit. I’m quite happy with this one and since it’s drawn in waterproof ink I may even colour it in later. Standing for a long time was making our feet ache so we went upstairs to see what else they had (plus there were some benches to sit on) we saw a case full of sea birds all in flight, I picked some little shearwater birds, it’s a view that’s very hard to get even with a camera because they’re so fast so this was ideal. Moving along the room was a case containing pheasants. I wish they had done a better job of naming the breeds there were so many different types of pheasant (apparently chickens are also part of the pheasant family. Educational too eh), after a long look on the internet I have decided this pheasant is called a silver pheasant. I loved his little red mask; he looked like he was off to a masquerade party hehe. We had a really fun day and ended up spending so long there we got kicked out! London is so busy we don’t stop while were there, back home now with tired feet and needing another rest! Last week we visited the local botanical gardens. They have so many lovely walks there and even in the middle of winter we find things to look at. 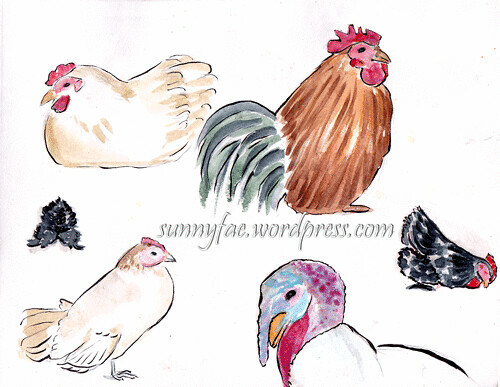 There are about a dozen chickens scratching around, we decided to sit and draw them (insert scrappy sketches). 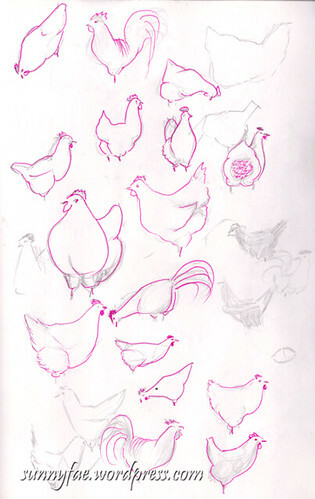 I had drawn the chickens with graphite which doesn’t show up on my scanner but I found a pink pen while tidying up and decided to pick out the chickens I liked best with it. I have several pages just like this one; I think you get the general idea though. Not amazing art work I admit, it just gives me an idea of the shapes and poses. I really wanted some photo’s but I only had my ipod with me so we waited till they came close to the edge of the enclosure and snapped a few photos. One of the chickens Henrietta (not her real name) came right up to us (she was ready for her close up). The pictures came out surprisingly well. 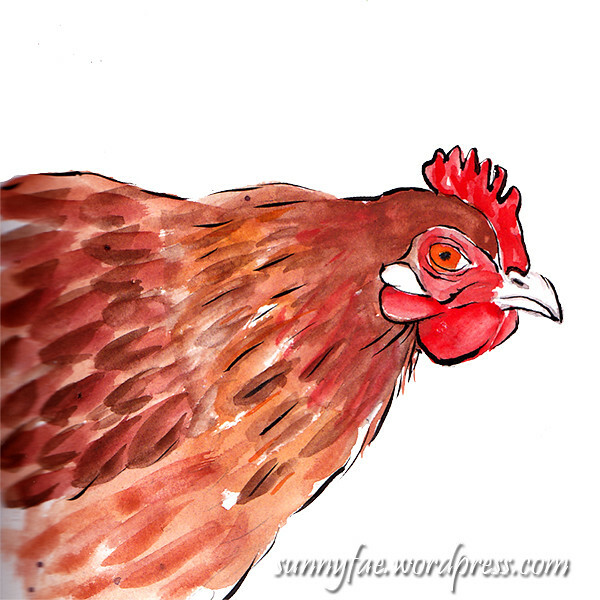 Later at home I drew some sketches of Henrietta in my sketchbook. I used Payne’s Grey for the feathers but thought they were a little too blue, so I painted another layer mixing a little black into the Payne’s Grey. I didn’t want to dull the colour, just darken it a bit. A different view of Henrietta. 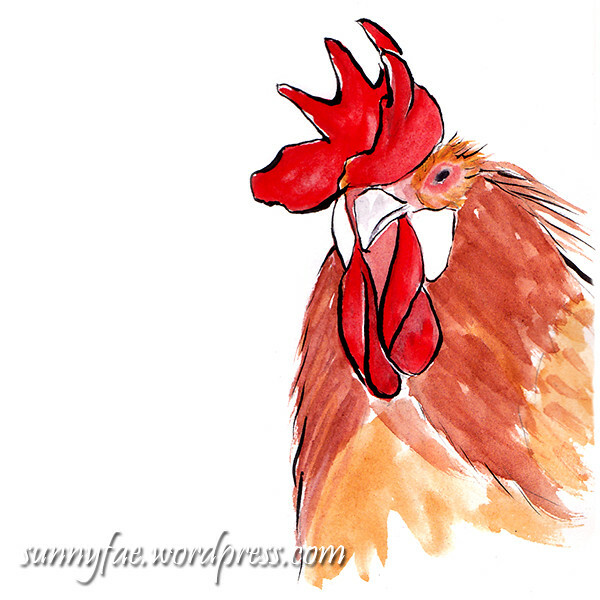 I’m not sure what it is about chickens, I love watching the scratch around and bustle about. Earlier in the week we went into town, we had decided to check out the local Christmas market. There were things to see and taste (they had some extremely good cheeses) and at the end we came upon a giant tea-cake seller (the tea-cakes were very big not the vender) after buying one each we went into the new theatre/cinema/caffè/restaurant/library! They have moved everything into one big building and so we needed to check this out too. We ordered hot chocolates took out our tea-cakes and whilst we were sitting there we pulled a few books off the shelves to read. 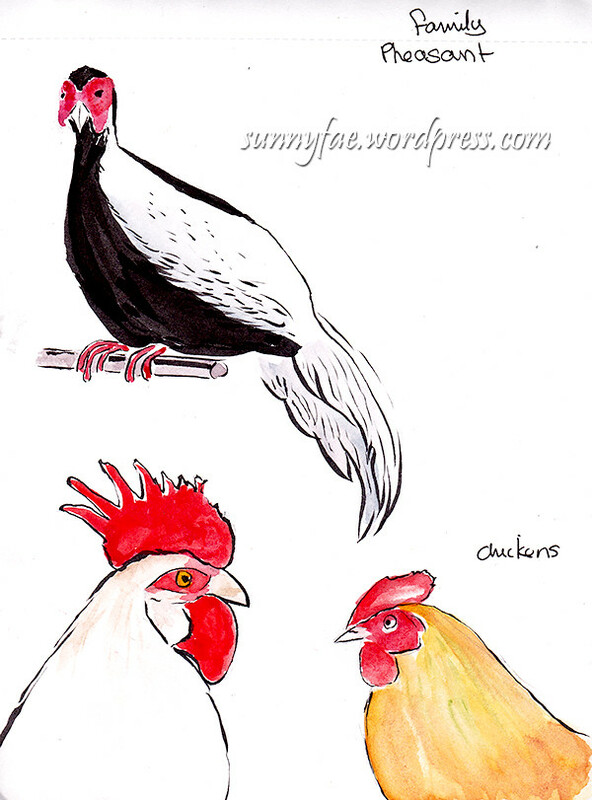 I found a book about poultry that strangely contained pigeons and ostriches; we got out sketch our books (ever ready) and started to draw as our drinks cooled. 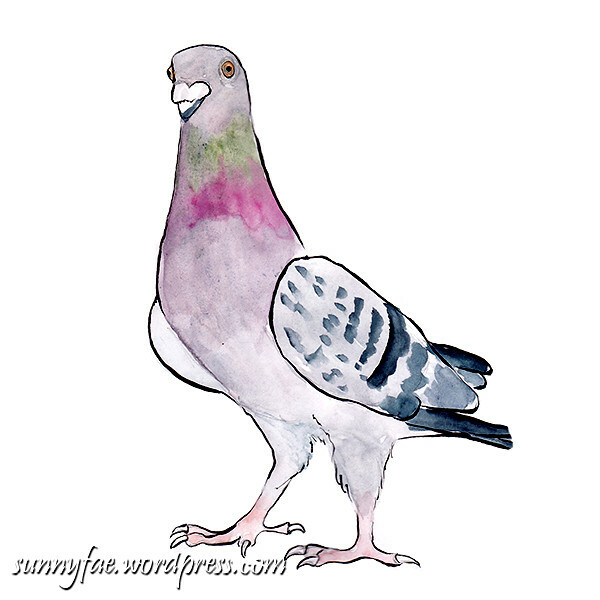 I drew a pigeon, I would have taken the book home but it was “reference only” so I snapped a few cool looking chickens on my iPod to take home with me. 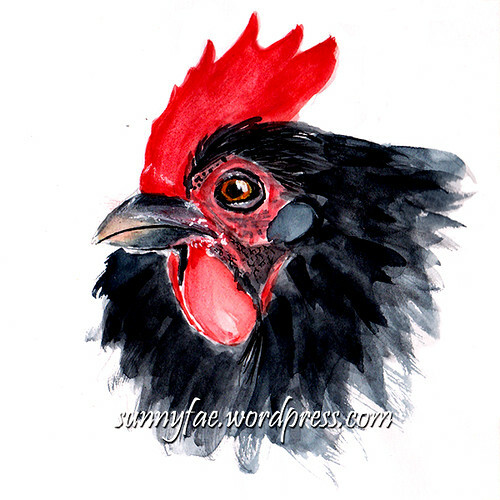 The book is called “Storey’s Illustrated Guide to Poultry Breeds” it has lots of fine-looking bird pictures in it. During the week I’ve been drawing from the pictures I took and having a lot of fun in the process. 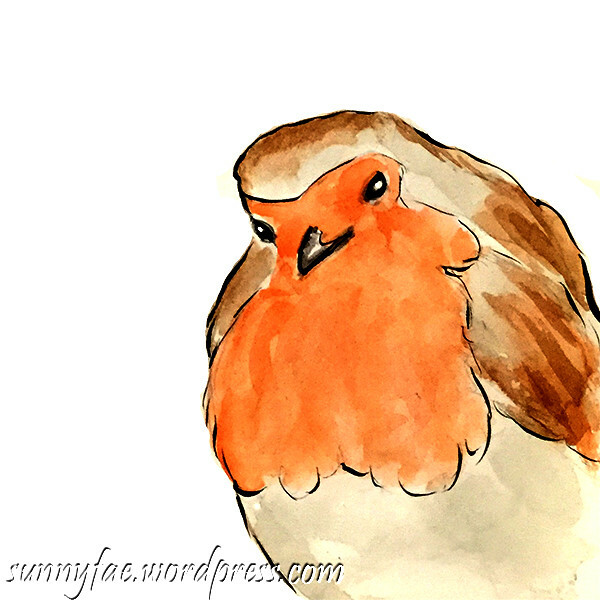 Friday was the 1st December, I drew a little robin in the corner of my sketchbook page and since I liked it decided to post it on twitter for the @pinchpunchpost challenge. At the start of every month they post up a theme, usually an animal, then on the first day of the next month you can post pictures with that theme. This month it was a robin. The theme for January is panda so if you feel like joining in post a panda on your twitter feed January 1st tagged #punchpunchpost. We’ve decided we really like drawing in the library/everything else and we will be doing it again in the future, it was actually very relaxing.